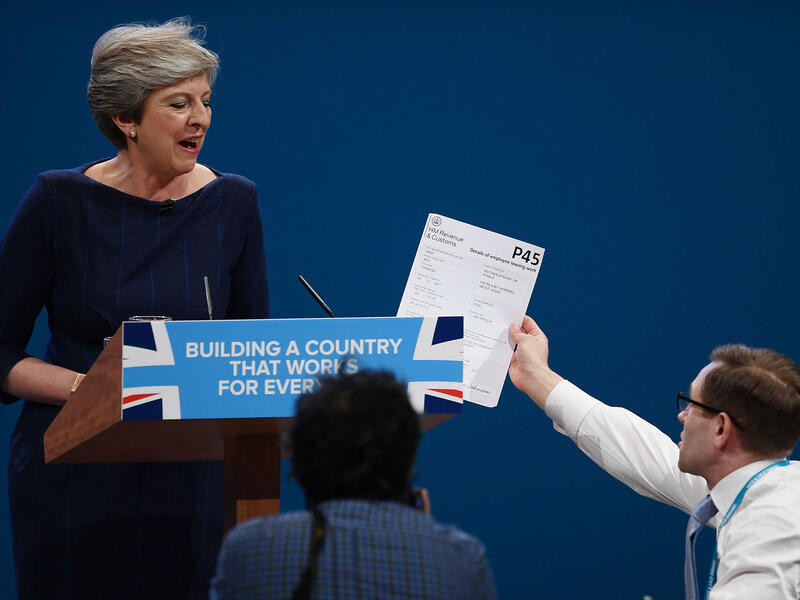 Comedian Simon Brodkin, also known as Lee Nelson, hands Prime Minister Theresa May a P45 form — the equivalent of a pink slip — during her speech at the Conservative Party Conference in Manchester. 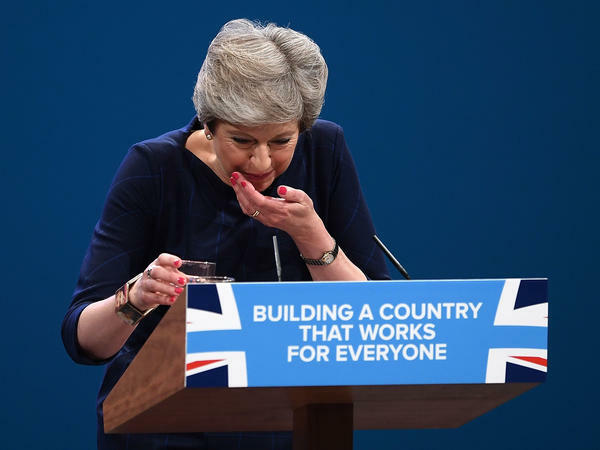 May takes a cough drop during her keynote speech to delegates and party members on the last day of the Conservative Party Conference in Manchester. 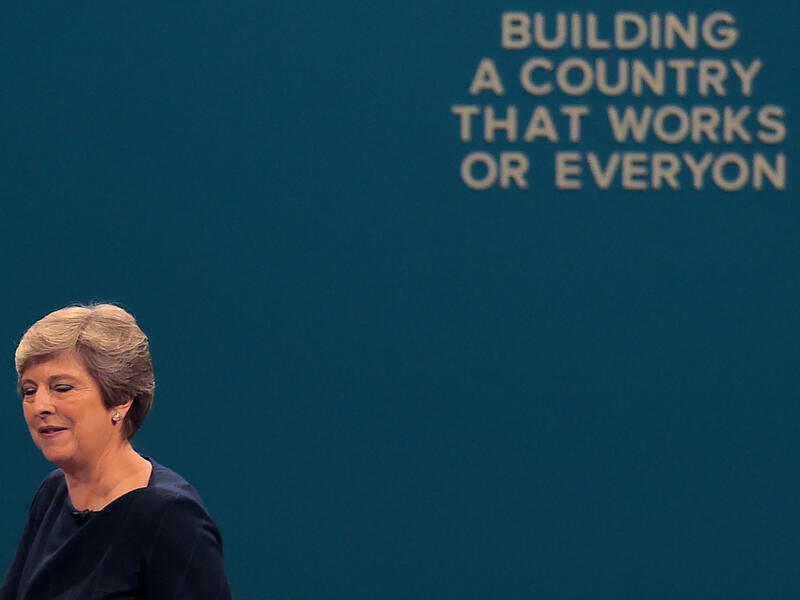 After delivering a speech in Manchester on Tuesday, Britain's Prime Minister Theresa May walks past a slogan whose letters fell off while she spoke. British Prime Minister Theresa May gave one of the most important speeches of her political career Wednesday morning. It could not have gone much worse. The speech, which she delivered to a packed audience of her fellow Conservative Party members in Manchester, started reasonably well — until a prankster approached the stage. The man handed the leader of the United Kingdom a P-45 form, the British equivalent of a pink slip. "Boris asked me to give you this," the man could be heard saying to May. Identified later as a comedian named Simon Brodkin, also known as Lee Nelson, the man said the paper was signed by Boris Johnson, May's foreign secretary. Johnson had been seen as undermining May before the annual conference by staking out a tougher position on the U.K.'s plans to leave the European Union, known as Brexit. A former London mayor, Johnson is widely thought to want to replace May. After receiving the paper, May fell into a series of coughing fits that dogged her for the rest of her speech. She drank glass after glass of water. Chancellor Philip Hammond, essentially the U.K.'s treasury secretary, stepped up from the audience and handed her a throat lozenge. At times, May's voice fell to a whisper. But even as she soldiered on, letters from the party's slogan – "Building A Country That Works for Everyone" --- fell off the wall behind her, making it read "Building A Country That Works Or Everyon." The scene might have seemed comic had it not been so excruciating to watch. "Bloody hell!" exclaimed one audience member. "Theresa May's conference speech was such an epic disaster her message literally fell apart before our eyes," read a headline in the Mirror, a British tabloid. Many who attended expressed sympathy for the prime minister. "Your heart goes out to her, you're willing her to succeed," said James Cleverly, a Conservative member of Parliament. "You could feel it, it was almost palpable in the room — the whole party saying, 'C'mon, girl, you can do this!' And she did." Many outside, though, saw the speech as a metaphor for a prime minister who led her party into an electoral debacle in June and has never recovered. One Twitter user posted a GIF of a Formula One race car crashing after its front wheels simultaneously popped off. May announced a snap election back in April, when her party was riding high in the polls and she appeared unbeatable. Her goal was to rack up an even bigger parliamentary majority in advance of Britain's move to leave the European Union, the biggest challenge the nation has faced in decades. Instead, May ran a poor campaign in which she appeared robotic and resorted to repeating empty political catchphrases. The media soon began referring to her as the "Maybot." Instead of increasing their parliamentary majority, the Tories actually lost it. May's speech today was seen as a crucial opportunity for her to exude confidence and authority over a ruling party that members say now faces an identity crisis and an uncertain path forward. She spent part of the speech highlighting important issues in British society, including a renewed debate over capitalism and socialism that the party thought it had won in the 1980s under Conservative Prime Minister Margaret Thatcher. Now, the Tories face a resurgent Labour Party, led by Jeremey Corbyn, an avowed socialist. "We must come together and fight for this mainstream Conservative agenda," May said. "To win the battle of ideas in a new generation all over again. For those ideas are being tested and at stake are the very things we value." Even before May delivered her remarks, there were accusations that parts may have been plagiarized from The West Wing. But her speech is less likely to be remembered for its ideas than for her painful struggle to deliver them.